The purpose of this page is to provide a quick summary of Dynamic Investments - how they work, how they perform and why they will dominate the future of investing. All information provided here is explained in more detail on other pages of the site that can be accessed from the Main Menu at the top of this page or via links provided in the content of this page. 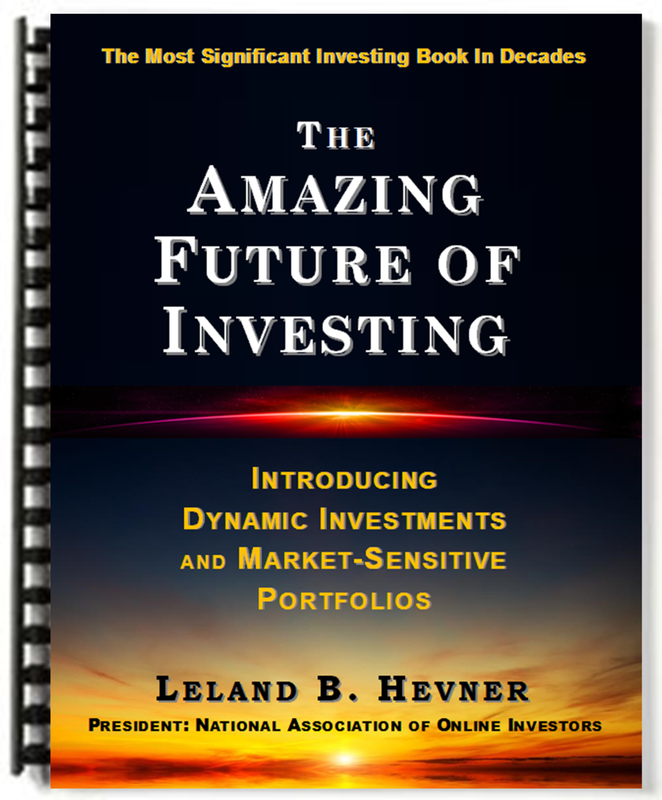 First, allow me to introduce myself as Leland Hevner, President of the National Association of Online Investors (NAOI). My CV is accessed in this Media Center by clicking here. Formed in 1997 the NAOI is the nation's leading supplier of college-level, objective investor education. We have taught thousands of individuals how to invest with confidence. In 2008 I shut down our teaching activities. Why? Because as the stock market crashed the portfolios I was showing my students how to create were crashing along with it. I had to face the fact that the portfolio design methods I was teaching, as dictated by Modern Portfolio Theory (MPT), were severely outdated and simply didn't work in modern markets. Yet they are still used universally today without challenge. At that point I redirected NAOI resources to finding a better approach to investing. After 5 years of research and development with 3 more years of testing we found it in the form of Dynamic Investment Theory and a next-generation investment type we call Dynamic Investments. Both are explained on this site. Years of teaching personal investing at the college level have shown me that Investing today simply does not work for the public. It is a very complex world filled with a massive amount of variables that the average person with money to invest is simply not equipped to cope with. As a result they have little option but to entrust their financial futures to third party advisors - who are also salespeople - and just accept the recommendations they are given without question. This unacceptable state of affairs stems from the use of Modern Portfolio Theory (MPT) as the "settled science" standard for portfolio design today. The problem is that MPT was introduced in 1952 when markets were a different and far "quieter" place as shown in the chart at right (click to enlarge). While markets have evolved significantly since then, the portfolio design methods we use to cope with them have barely changed at all and they don't work in modern markets. My goal became to get the evolution of investing started again by developing a new approach to investing that could not only cope with but thrive in today's market environment. I had no misconception that doing so would be easy, quick or inexpensive. But I had no option. I simply could no longer teach investing methods that didn't work. Following 5+ years of research and 3 more years of field-testing, we found the approach that I was seeking in the form of Dynamic Investment Theory and the use of the Dynamic Investments that the theory creates. This entire Web site is devoted to describing this revolutionary approach to investing which is summarized below. Dynamic Investments (DIs) are the market's first investment type that is "sensitive" to market movements and has the internal intelligence to take advantage uptrends and to avoid down trends. To meet this goal, each DI has the following components as illustrated in the diagram at right. Performance Enhancer: This is proprietary NAOI component that substantially lowers the risk of all DIs while enhancing their ability to capture positive returns. This component is discussed in The Dynamic Investment Bible and will be revealed to any organization that works with the NAOI via a consulting contract. Once created by an NAOI-trained designer, a DI's components do not change. Thus, an investor can simply buy and hold it for the long-term while it periodically and automatically signals trades based on objective measurements of market trends. A DI can be accurately described as a passively managed, active investment, providing its holder with the best features of both styles. Since DIs have the universal goal of capturing the positive returns that the market offers at all times and in multiple areas, DIs do NOT need to be customized for each individual investor. As a result, each DI is a comprehensive consumer product that can be bought off-the-shelf from multiple vendors. Thus, DIs "productize" the world of investing - and this is huge! This is nothing less than the "Holy Grail" that financial experts have been seeking for decades. They haven't found it. The NAOI has. The change brought into the world of investing by Dynamic Investments is not minor - it is game-changing. To illustrate this point I present the following table that shows and compares the performance of multiple, but related, investment types. The performance period consists of the 10-year period from the start of 2007 to the end of 2016. Shown in the table are yearly returns for each investment followed by the average annual return for each along with its Sharpe Ratio which is a measure of how much return is earned for each unit of risk taken - the higher the better and anything greater the 1.00 is seen as a superior investment. The fist two data rows show the performance of two Exchange Traded Funds (ETFs), one that tracks a Total Stock Market Index and one that tracks a Total Bond Market ETF. The third row shows the performance of the simplest Dynamic Investment possible (called the NAOI Basic DI) that holds the two ETFs in its DEP as explained above as purchase candidates. The final data row show the performance of a typical MPT portfolio with the allocations to the Stock ETF and the Bond ETF shown in the table. By studying this table you can see that the NAOI Dynamic Investment switched between stocks and bonds periodically to take advantage of the uptrends of both stocks and bonds while avoiding the downtrends of each. This while the MPT portfolio simply bought and held both stocks and bonds with the ratios shown with no sensitivity to market movements. An average annual return of +30.6% with a 1.18 Sharpe Ratio for a 10-year period that included a major stock market crash is astounding - "experts" will say it is impossible. And it is impossible in a world centered on MPT portfolios. But you will learn on this site that performance such as this is not only possible but not difficult to achieve using Dynamic Investment Theory portfolio design methods and the innovative, self-managing Dynamic Investment type that is introduced on this site. Even higher returns are achieved by placing other, and more, ETFs in the DI's DEP. By doing so, the DI designer gives the investment more areas of the market to search for positive returns. The fact that DIs can produce higher returns in this manner as opposed to requiring the acceptance of higher risk blows Modern Portfolio Theory out of the water! And the fundamental fabric of how we invest today is torn asunder! With a cursory overview of what Dynamic Investments are and the amazing performance they can produce, go next to a page that shows the latest Press Releases issued by the NAOI or jump to a page that presents multiple fascinating and actionable articles and article ideas that inform your audience how DIs can be used by both individual investors and financial organizations to gain a massive competitive edge in the field of investing. But before leaving this page, review the resources offered by the NAOI that enable both individuals and professionals to take full advantage of this new approach to investing as presented just below. Of course the whole intriguing story of why and how Dynamic Investments were developed cannot be told on this Web page or this Web site. It is told in the recently released book entitled The Amazing Future of Investing. You can read about it by clicking here. And it can be purchased by clicking here.